Versatile and handsome enfilade can serve as a row cabinet or buffet for a hall or dining room. Two doors, six drawers 160 x 91 x 52 cm 63 x 36 x 20 in. traditional sideboard / hardwood CARACOLE CLASSIC : A NEW REFLECTION OF YOU! FABERGÉ A cocktail cabinet that creates a visual excitement even before the cocktails are served! The abstract embossed pattern is intricately and painstakingly carved by hand. OISEAUX A fabulous Christopher Guy cabinet with unique carved handles and exquisite bas-relief songbirds carved into the blonde wood door panels. Ideal for books, cocktails or entertainment equipment. ... finish with golden leaf decoration embellishes the table top and the doors of the OLGA cupboard. The one-door CAPRI display cabinet is an ideal dining-room complement. GRIS COUTURE LACQUERED BEECH Lower section with two panelled doors, Directoire palmettes in bronze, with baseboard, one shelf on support rails. BESPOKE YELLOW LACQUERED BEECH Of Merovingian inspiration, 1900, in the spirit of C.Bugatti. Wooden top, two doors, two shelves on support rails, decorated with rosettes and hobnails in antique iron,"1000 raies" patina. ... winding lines, and are offered in a cream, walnut and mahogany finish. The rooms are meticulosly modern, but retain a thorougly classic style. The Cezanne Collection is the answer to the need of comfort and wellness. This range gives the chance to frame different types of use, from the formal to the convivial one. Botero is the latest collection: particular tones characterize the lacquering of the interior in line with the polish of the outside. Style:Italy 19th century Details: Plume walnut, Inlays, Bronze mountings Dimension: cm. 185 x 58 x 95 h. 72¾" x 22¾" x 37½" h.
ART. 9973/4 4-DOORS CUPBOARD WITH 1 DRAWER, FINISH WHITE PEARLY WITH GILTED PROFILES COD. 42 MEASUREMENTS: CM 203 X 56 X 96H. W 151 x D 82 x H 78 cm. Three drawers and three doors frame in massive wood. Veneer : blackened peartree. Design : Japanese lacquer finely hand made. Marble : White Carrara. A classic sideboard is a table with cupboards or drawers normally designed for storing tableware or other items. It features construction methods, materials or forms associated with a particular epoch. On ArchExpo, these items are categorized by properties such as style or material. This furniture is found in both domestic and commercial spaces such as living rooms, corridors, reception areas and dining rooms. It may be chosen over other styles of furniture for properties such as its finish, construction or appearance. It is used to store items such as tableware and linen, to display items or as a decorative piece. 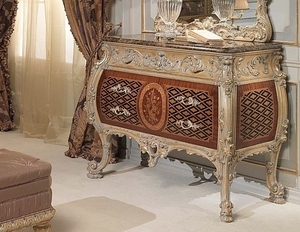 It may have an elaborately carved design with special finishes and veneers (as do some Louis XV pieces) or have a simpler, rectilinear form (such as Regency sideboards). Popular construction materials include solid woods, such as oak. Traditional joinery techniques are sometimes employed (e.g., mortise-and-tenon or dovetail joints). When choosing a classic sideboard, consider whether a particular style or finish is required to match other furniture. Ornate or simple, it may be designed to contrast or complement the existing decor. Ensure that drawers and cupboards are suitable for the items to be stored. The construction of the unit, including type and quality of materials, may affect its sturdiness and maintenance requirements.